Governor John Hickenlooper to Sign the FairChance CareerFair Award. The FairChance Career Fair is a Colorado Career Project Event, August 4, 2016, 10am to 1pm at the Denver-Auraria Campus. 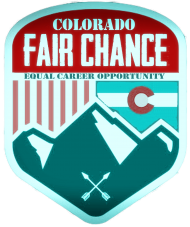 The Colorado FairChance Career Fair is August 4 at the Denver-Auraria Campus, 10am to 1pm! Up to 70 Employers.